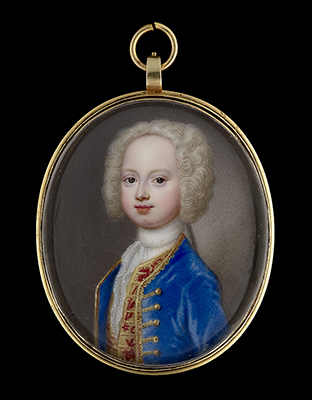 Portraits of non-royal children are rare within Christian Friedrich Zincke’s oeuvre, which makes this sensitive portrayal of a young boy in a formal coat, cravat and wig, particularly unusual. Zincke was born in Dresden to a family of goldsmiths and after training in his home town, he relocated to London at the invitation of Charles Boit, then the leading practitioner of enamelling in Europe. For some time he worked alongside Boit, but soon established his own studio and counted amongst his earliest patrons the highly influential Sarah, Duchess of Marlborough. From 1714, when Boit fled England to escape his creditors, Zincke became England’s preeminent enamellist. Zincke’s output was prolific and although his eyesight began to deteriorate during the 1720s, he was made enamel painter to George II and cabinet painter to Frederick, Prince of Wales in 1732, which increased his patronage further. Unlike other enamellists, many of his portraits were made ad vivum, although he was not averse to flattering his sitters at their request; Queen Caroline demanded that she be made to look twenty-eight when she was forty-nine. His enamels can be found in most significant public and private collections, including The Royal Collection, the Portland collection at Welbeck Abbey, the Victoria and Albert Museum, London, and the Ashmolean Museum, Oxford.